Budo Taijutsu Course should be called. Ten Master instructors share the most important Bujinkan budo principles! One reason is that it is hard to define – much less structure into a body of study. It is an art that needs to be interactively practiced with someone that is beyond your own current knowledge level. It is really a study of concepts, principles and ideas to use in combat. Like exlporing the proper distance, controlling the space (kukan), take your opponent off balance, strike witout being seen, etc. (the course has over 100 principles). Even Soke Hatsumi does not teach a formal way but yet uniquely demonstates his concepts and principles to any form. He demonstrates simple but yet complex relationships of budo. This course was created to help ALL Bujinkan Budo Taijutsu practitioners understand all the dynamic relationships of the Bujinkan art. This art has never been defined the way it is in this Bujinkan Budo Taijutsu Course. For many students it has been difficult to determine what they are really studying and what is important in that study. One reason is that the training draws from 9 different schools and overlaps in it’s concepts in every class. The other is that while concepts are explored they have not been defined all in one place leaving the student to determine for themselves what is useful in the training. This has it’s pros and it’s cons. Many students and instructors have become confused. AN OVERVIEW TEACHING ON WHAT IS THE MOST IMPORTANT LESSONS AND CONCEPTS IN LEARNING THE ART. This Bujinkan Budo Taijutsu Course has 11 DVDs and 236 page Binder Manual Reg. Price $297- And they are all about 1 hour long! REG Investment $297- Limited Time SPECIAL Only $247- Folks that is only about $12 a DVD!! Actually, now that i think about about NiNE DOLLARS a DVD!! Every year when I plan our annual Tai Kai event I chose a very special special theme for the training. When I sat down to think about it I had this great brainstorm that lasted for several hours – I mean I literally could not stop writing for almost 3 hours! This really is a great question to ask yourself at any time about the art you study. And when you have studied an art for over 30 years and have made over 50 trips to Japan to train with Soke Hatsumi and other Shihan this is a superquestion! But I don’t want to get off track here – most important to me were all the answers I got to that question and the method by which I got them. They literally came flying into my brain and at first I wrote them down as bullet points – but then as I went back over the bullet points I received specific exercises on how to share these points with you. WOW! But I didn’t stop there. I then contacted my senior instructors and asked them to write out their 10 top most important insights on this question. From those answers I asked some of them to work a few months on a lesson plan and come share it at the event. Helping Shidoshi Richard Van Donk (15th Dan) in share their master Budo Taijutsu principles in this course with their years of experience are Shihan’s Dan Ordoins (15th Dan), Linda Van Donk (13thDan), James King (13th Dan), John Owsiak (8th Dan), Carlito Flores (8th Dan); Shidoshi’s Charles Benham 7th Dan, Roman Marquez, 7th Dan, James Clum 7th Dan, and Shidoshi-ho’s Jamie Daiken (4th Dan) and Theodore Schink (4thDan). These IBDA instructors have all trained with me (and others) and have been to Japan to train in the hombu dojo directly with Soke Hatsumi. You have to agree that this adds up to a wealth of experience in budo. Get the best of what they have learned in the arts presented to you. Get started and enjoy this training. This course on Budo Taijutsu was created to help ALL Bujinkan Budo Taijutsu practitioners understand all the dynamic relationships of the Bujinkan art. This art has never been defined the way it is in this Bujinkan Budo Taijutsu Course. For many students it has been difficult to determine what they are really studying and what is important in that study. One reason is that the training draws from 9 different schools and overlaps in it’s concepts in every class. The other is that while concepts are explored they have not been defined all in one place leaving the student to determine for themselves what is useful in the training. This has it’s pros and it’s cons. Many students and instructors have become confused. Grandmaster Masaaki Hatsumi (also known as Soke) is the founder and International Director of the Bujinkan Dojo with its Hombu Dojo, the Bujinden (Divine Palace), residing in Noda City, Chiba Prefecture, Japan and has an administration office attached to his downtown home. He is married to his lovely wife, Mariko, a famous Japanese dance teacher and 10th dan director of women’s training for the Bujinkan. Dr. Hatsumi is the inheritor of nine Ninjutsu traditions from the late O’Sensei Toshitsugu Takamatsu (the last true living Ninja) in the early 1970’s just before Soke Takamatsu’s passing in 1972. It is said that Dr. Hatsumi was the only one receiving in-depth training with the great Takamatsu during the last 15 years of his life. Soke Hatsumi is the author of over a dozen books and 40+ dvds on the art of Ninjutsu and Budo Taijutsu. He has been featured in almost every magazine relating to this subject in Japan, and throughout the entire world. He has authored countless magazine and newspaper articles on Ninjutsu and on living a productive life. He wrote, directed and acted in 50 episodes of a television series called ‘Jiraya’ which was the number one watched kid’s program in Japan. He is now what is called a historiographer of martial arts for various plays and movies, acting as a consultant to ensure that what is being portrayed is done correctly based on true history. The collective teachings that he inherited from the late O’Sensei Toshitsugu Takamatsu are now referred to as Budo Taijutsu. 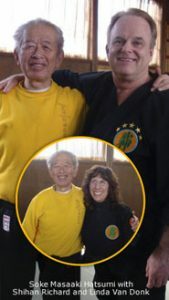 Since the early 1980’s Shihan Richard Van Donk and his wife Shihan Linda have pioneered Grandmaster Masaaki Hatsumi’s Ninjutsu around the world with their proven study programs and International dojo affiliations. Richard, a personal student of Grandmaster Hatsumi, was one of the first Bujinkan non-Japanese students to become a Shidoshi, a fully licensed teacher of the warrior ways of enlightenment in 1987 when he passed his 5th degree test. He was awarded 10th dan in 1995 and his Ju-Godan on Dec 2nd, 2004 (Soke Hatsumi’s Birthday). Today as director of the International Bujinkan Dojo Association, known as IBDA, he is still working on study materials for his students around the world. At IBDA Shihan Richard J. Van Donk offers a strategic standardized step-by-step learning and ranking system. This special system has been refined for over 20 years by Shihan Van Donk’s some 50 trips to train with Soke Hatsumi, his owning every piece of his printed material, several hundred published and non-published videos, personal training with Soke who answered all his questions, personal training with most all senior Japanese instructors, and instructing several thousand students to every level in the Bujinkan, including many students to high Judan levels with lots of them starting with the distant learning Ninjutsu BlackBelt course. Bottom Line our method works. The proof is in the students who’s lives have been changed by our training. Yours will be too when you study with us. Everyone who is affiliated with us will have studied this material or has proven to Shihan Richard Van Donk that they indeed know the material presented in our courses. There is no exception and there will be no exception. We believe in our standard and recommend that all teachers do the same. We believe that the future of Ninjutsu will depend on this. Ranks just given without meaning or the student knowing what they have learned for the rank they where given is in our opinion unfair to the student. We prefer the University approach. You can learn anything you want in any order you want with us. Do what you love and the rank will come as you learn and can demonstrate the required material as outlined very clearly in our Kyu and Dan ranking curriculum. All of our ranks have always been and always will come through Soke Hatsumi in Japan. And that is a rank you can be sure will be recognized worldwide. Below is a short overview of what you learn at each level. At this beginning level you will learn an overview of all the 9 schools and their weapons to prepare you for the deeper study of Budo Taijutsu and all the 9 schools wazas and principles. Ninpo Taijutsu training from 9th kyu to Shodan you learn a strategic systematized overview of the Ninjutsu 9 schools including foundations, postures, punches, kicks, weapon basics, history, stealth, chokes, grappling, throws, meditation, proper body movement and much, much more. Hundreds and hundreds of techniques. On the average our students spend 3 years of solid training on this level as it covers main aspects of Togakure Ryu, Gyokko Ryu, Koto Ryu, Kukishinden Ryu, Shinden Fudo Ryu, Takagi Yoshin Ryu preparing you for a deeper focus of individual schools that you will study at succeeding dan levels. Kyu Grades are divided into these levels. Once completed you become a Shodan and receive your BlackBelt. After learning a very solid overview of the nine traditions that make up the teachings of the Bujinkan Dojo you will begin to explore the actual school (know as Ryu) material in a more in depth way by studying the deeper principles and partner exchange forms called waza. Unlike a Kata which is performed by oneself to perfection. Wazas are interactive drills that are done with at least 2 persons both in a formal way and with many variations so that the principles of the school can also be learned. Wazas also help you learn timing, distancing, and eventually true budo protection methods. Each of the 9 schools have their own focuses and attributes and may favor certain weapons. 2nd degree Black Belt training includes Kosshijutsu study of the principles and Gyokko ryu wazas of Jo Ryaku no maki, Churaku no maki and Geryaku/Mutodori gedan plus 24 Kukishinden Ryu Hanbojutsu, Shoden/Chuden/Okuden level wazas. 4th degree Black Belt training includes principles and wazas of Takagi Yoshin Jutaijutsu including Shoden No Kata/Chuden No Sabakigata/Chuden No Tai No Gata/Okuden No Kata levels and Eri Shimegata, Moguri levels. Dakentaijutsu including the Shoden / Chuden / Sabaki Gata / Okuden No Kata / Shirabe Moguri Gata levels. Weapon is Naginata and Roikumiuchi. 10th degree Black Belt training includes the understanding of Budo Taijutsu Ura Waza principles Happo Bikenjutsu Level 4 and a personal choice of a deep spiritual practice. Take a look at Gyokushin Ryu principles. This top Shihan ranking will take the signatures of Shihan Van Donk and at least 2 other Judans plus the final agreement of Soke Hatsumi. *The 5 advanced levels of Judan are awarded by Soke Hatsumi at his discretion. While really incorrect they are often referred to 11th to 15th dan, even by Soke Hatsumi as it became easier to say. IBDA™ ranking and study structure goes all the way to 10th degree, including the 5 elemental levels -Judan Kugyo Happo Biken. There is a lifetime of learning available and we can help you travel the journey as far as you want to go. Learn to become a junior licensed teacher of the Warrior Ways of Enlightenment. The art becomes even more exciting when you can share it with others. A comprehensive training course is established by IBDA. This work was pioneered by Shihan Richard Van Donk who was the very first to write and establish a complete course on how to become a teacher of the Bujinkan arts and require it’s study to become a Shidoshi or Shidoshi-ho. You know that an IBDA instructor is also trained to teach.